Manchester City have accepted the resignation of chairman David Bernstein. Bernstein's decision to quit follows last week's resignation of managing director Chris Bird and comes on the day when City were due to hold an emergency meeting. His resignation follows a week of fierce speculation at the club in the wake of Bird's departure. And the former chairman is clearly unhappy about an apparent difference of opinion over transfers and financial issues within the City boardroom. "Over the last few months, there has been a divergence of views on fundamental strategic issues, particularly concerning finance and management structure," Bernstein explained in a statement. He added: "I believe this has inhibited my ability to direct the club in the way I would wish." Bernstein hinted that he feels his position at the head of City's hierarchy had recently been compromised. "On my appointment in 1998, I emphasised three factors required to fulfil the chairman's role effectively - unity, stability and professionalism. "Until recently, my board, major shareholders and key employees have successfully worked together to achieve these," Bernstein said. 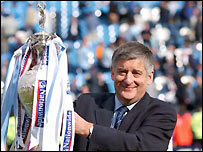 Bernstein took over at Maine Road when City were languishing in the Second Division and has overseen two promotions and the imminent move to a new stadium. The appointment of Kevin Keegan as manager and signings of the calibre of Robbie Fowler and Nicolas Anelka were also brokered by Bernstein. "During my five years as chairman, the club has made outstanding progress. "We have advanced from the depths of the second division to mid-table in the Premier League. "We are only months away from moving into our new stadium and have developed an outstanding training ground. "We have an excellent squad of players in which we have made considerable investment and an outstanding team of people employed at the club. "Manchester City is respected and stands on the brink of real achievement." Bernstein also paid tribute to City's fans, who have stayed loyal to the club despite their struggles in recent seasons. "I would like to thank our wonderful fans for their backing. They have been fantastic in their support, which has never wavered even during the most difficult times. "I have been touched by their kindness and enthusiasm. "I have supported Manchester City since I was a boy and I am desperate for us to succeed." Deputy chairman John Wardle will take over the chairman's role on a temporary basis, but Bird's position will not be filled until a detailed review of the management structure takes place during the summer. "Bernstein has lost out in an internal power struggle"